Marcus Vipsanius Agrippa was the closest friend & most trusted ally of Octavian from youth. The two were about the same age, but Agrippa was not an aristocrat. His fortunes depended on Octavian's support, which he repaid with able military & administrative service. He was responsible for many of Octavian's victories over both the assassins of Julius Caesar & Marc Antony. He commanded Octavian's fleet at Actium (31 BCE). 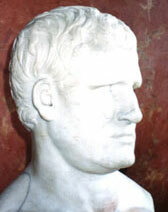 When Octavian was on a campaign, Agrippa managed the affairs of Rome. Twice Octavian appointed him consul, despite his lack of patrician credentials. In his 2nd term (27 BCE) he purged the Senate of any who opposed Octavian's nomination as emperor. When Augustus became ill (23 BCE), he named Agrippa his successor & married him to his daughter, Julia, to give him the legal right to become emperor. Although Agrippa himself did not live to assume that role, his daughter Agrippina became the mother of one emperor [Caligula] & grandmother of another [Nero]. In 17 BCE Augustus made Agrippa vice-regent of the eastern Mediterranean provinces, with authority over all regional governors. In this capacity he became a close friend of Herod, whose grandchild [Agrippa I] was named after him. He died of pneumonia at age 51 & was eulogized by Augustus for his contributions to the Pax Romana. 16.12-62, 86, 141, 157, 167-173. Marcus Vipsanius Agrippa - article in Wikipedia's growing web. Roman silver denarius bearing M. Agrippa's image, minted 13 BCE, just a year before his death. Octavian's image is on the other side of this two-faced coin, indicating their co-regency.